A central part of the tradition surrounding holy wells is the consumption of the water. This photo shows three cups on top of the low wall surrounding Our Lady’s Well, Timoleague, Co. Cork, which is sunken into the ground. On the outside of the wall, the gravel of a path surrounding the well can be seen, while on the inside the wall leads down to the still water. 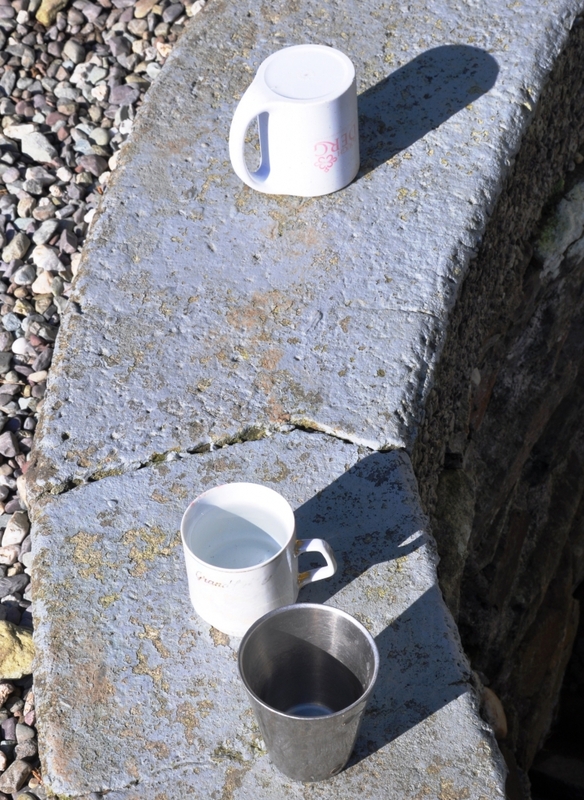 The three cups – a simple metal handle-less one, an old porcelain one with faded writing and a plastic mug from Lough Derg – rest, casting shadows in the mid-winter morning, awaiting use in personal and communal acts of devotion and reflection. The objects embody beliefs, vernacular traditions and absent rituals. The presence of the Lough Derg cup is a nice link between this local spot and the national pilgrimage location.